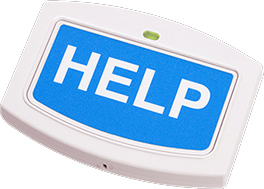 Do you have a need for a silent alarm? Do you worry something might happen and no one will know? The PERS unit consists of a base and a small pendant that can either be worn around the neck or wrist, or even Velcro-ed to a table or wall. There is also the option of placing a HELP button somewhere inconspicuous. When an emergency occurs an individual in duress can press one of the buttons and initiate a panic alarm. In this application however, the PERS unit is set up to operate silently – there is no annunciation, the machine makes no noise, the operator cannot be heard. However – the operator can listen in to what is happening. If necessary, the operator can dispatch first responders immediately or get in touch with designated individuals to inform them of the situation following a predetermined call escalation. 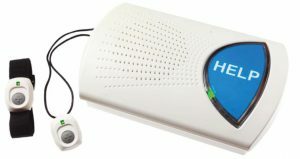 Inexpensive, easy to install, easy to use – this is the perfect way to enable you or your loved one to quickly and quietly signal for help. Available in landline or cellular form, the buttons have up to a 600′ range* from the base – this is just under 26 acres of coverage! Contact us today to see how this technology can be beneficial. Any setting, where the potential exists to be in an undesirable situation, is capable of using this system. As long as there is power, you are in business. Maybe your neighborhood has been having some issues lately – or maybe there is a domestic situation you are concerned about.